From Liu Heung Shing: Spring Breeze at Star Gallery. Photo by the author. In the first days of spring, Gallery Weekend Beijing brings out the very best in the city’s vibrant creative communities. Centered in the gallery district of Caochangdi as well as the 798 Arts Center, a cluster of former military factories-turned-walkable-complex of art spaces, pop-ups, antique and traditional crafts shops, and cafes in the Dashanzi district, the weekend is also timed to coincide with the Beijing Art Summit (March 22–24) and is a quick stop before Art Basel Hong Kong (March 29–31). Culled from the Pulitzer Prize-winning photojournalist’s 1983 book China After Mao, the black and white photographs here capture some of the biggest moments of the 20th century in their most intimate and carefree details. We see a lone soldier disclosing a smile; couples in young love and groups of friends traipsing through public gardens; young men reclining and enjoying a sunny afternoon. The lush, crisp images remain as buoyant and delighted as if they had been captured that afternoon, jaunting and savoring every last little freedom. For the past decade, writer, curator, and artist Qiu Zhijie has been drawing maps of his working relationships—using a a traditional landscape painting style—in murals and tabletop sculptures. Map of Mythical Animals – Every Living Thing Had Its Own Special Meaning, for example, sketches out areas including Sea of Underwater Beast and Nine Sons of the Dragon, somewhere between the landmass Mirage of Fata Morgana; it also cites the location of the Loch Ness Monster. The largest—and most popular—work in this sprawling exhibition is Map of the Art World, commissioned for the museum’s newly expanded entrance. The biting, hilarious work stretches several stories high, and threads together areas of this often absurd, codependent ecosystem. Regions include CURATOR, where AI Curator is next door to Curators who cry in the opening, not too far from The international curators who been kidnapped; COLLECTOR includes the region Collectors, who love to take photo with artists, and A collector who starts to create his own art work. Many a visitor lingered over the wall after discovering—and chuckling over—their own places on this cheeky illustration; you’ve been warned. Gathering a half-century of sculptures and works on paper by the economical American artist, Introduction to Practice manages to anchor the artist’s featherweight style. Delicately mounted scraps of plywood, colored paper, and thread-thin wire come together in elemental harmony, and, in doing so, demand an intimate look and fully engaged observation. The artfully sanded-down interiors and nonlinear layout of the space’s variously sized rooms, free-standing multi-angular corner interventions, and narrow stairwells makes discovering each new work feel like the next step in a treasure hunt. More of the artist’s recent work is concurrently on view at the Beijing outpost of the international Pace Gallery a few streets over (M WOODS ticket required for entry.). The quintessential L.A. artist opens his first exhibition on Mainland China with a crowd he knows well: California girls. 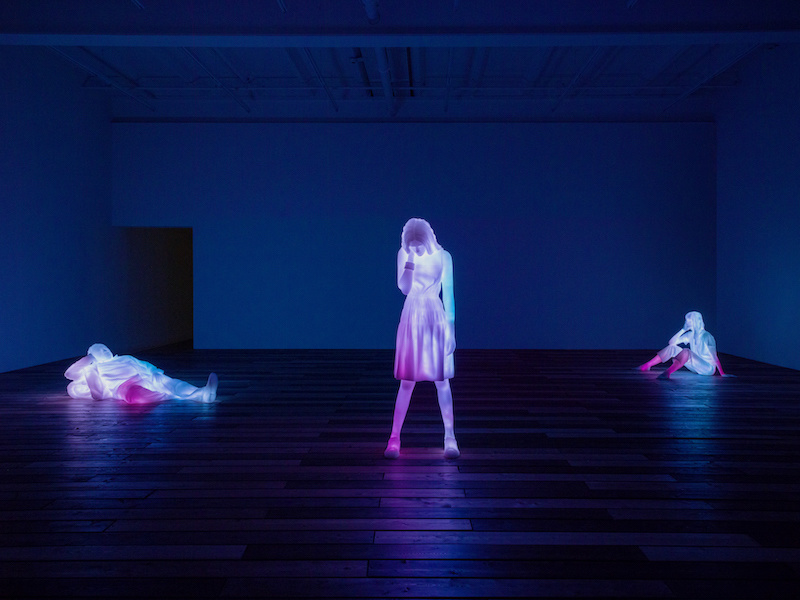 First previewed in an empty storefront in Hollywood during Frieze L.A., 3 Modern Figures (don’t forget to breathe) is a trio of life-sized LED fantasy women who are both statuesque and also quite literally radiant. In another room, the film NEW ERA follows Martin Cooper’s 1973 creation of the mobile phone and its resulting hyper-connectivity—and intrusion—taking place throughout our day, based on the artist’s conversations with the inventor. Presented in his typically dizzying hall-of-mirrors-and-screens installation style, calking through Aitken’s disorienting cinema creates an uncanny feeling of being untethered by living cordlessly. 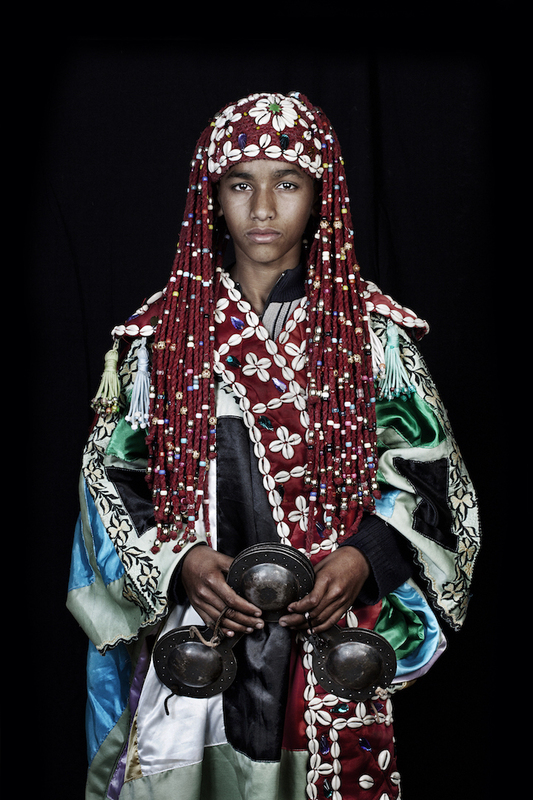 Leila Alaoui, Tamesloht, 2011. Inkjet print on wall paper, site specific dimension. Titled after the popular Algerian song of exile, this exhibition of films and photos begins with the artist’s searing, three-floor-high portraits series Les Morocains. Inspired by Robert Frank’s iconic The Americans series, the artist traveled throughout Morocco to document men, women, and children in traditional dress, shot against high relief on a glossy black background. Upstairs, the series No Pasara and Crossings capture North and Sub-Saharan African immigrants at various points of their journeys to safer, if more alienating, livelihoods in Lebanon and Europe, bringing to life individual stories that are often otherwise hidden in distressing immigration statistics. The young French-Moroccan photographer (1982–2016) died during an attack in Ouagadougou while on assignment from Amnesty International to document women living and working in Burkina Faso. 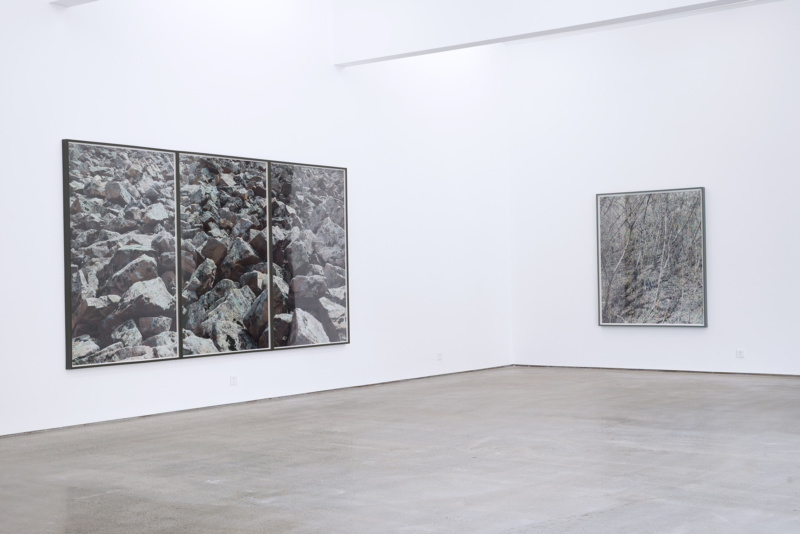 Wu Shanzhuan: Today Became a Holiday at Long March Gallery, installation view. Photo by Hu Liming. Seemingly composed of layers and layers of individual paintings, Long March Space’s massive central space is hung, salon-style; it’s curated by Inga Svala Thorsdottir, with exhibition design by Chen Chao. Wu Shanzhuan’s over 200 works hanging here have arrived by shipment from Hamburg, Reykjavik, and Shanghai, each one a gift for the artist’s “holiday” for painting for the exhibition’s seven-month-long duration. Shi Guowei: A Walk in the Woods, installation view at Magician Space. Image courtesy Magician Space. One of the city’s most dynamic young galleries presents this subtle, serene presentation of painted photographs by Beijing artist Shi Guowei. Bringing back the art of hand-coloring photographs, he documents trees, grasses, or rock formations in black and white, later painting each leaf in their organic shades of green and brown. Filling his camera frame with the forests’ minute details while cropping out the plants’ surroundings, the artist’s quiet focus leaves the noise—and the crowds—just outside the front door of this concrete cube. This survey of 20 paintings covers highlights Gong Lilong’s paintings starting from the 1980s, where his realist style transitions from traditional portraits of couples dancing in emotional embrace to the Chinese countryside. Installing the paintings in the rich context of deep turquoise walls, framed by matching velvet drapes, REHEARSAL re-examines the humor that classical style can offer. This expansive survey of the late French artist’s oeuvre is told in deeply personal chapters. The story of her psychologically towering, fragile practice begins with her Personage sculptures from the 1940s, continuing on to her Cell installations of the ’90s, as well as the fabric works of her last years, cut from her collection of clothing and bed linens. Perhaps her most instantly recognizable theme, Bourgeois’ insect creatures also take center stage here. The anchor of The Eternal Thread is a rare sighting of her monumental, iconic bronze spider, Maman (1999), on loan from London’s Tate Museum. The show was curated by Philip Larratt-Smith, the artist’s archivist from 2002 until her passing in 2010.